Vegan. It feels like we hear this word being used a LOT more today than ever before. There are vegan muffins in our coffee shops, vegan sections of our grocery stores, vegan clothing in our fashion magazines, and vegan diets being reported on in our magazines. And why stop with ourselves? If a vegan lifestyle is good for us, then perhaps we should consider feeding vegan dog food to our pets as well. If you’re thinking about making the switch, it’s important to be educated about the topic. It’s no small matter changing a pet’s diet – and it’s always best to be armed with knowledge of potential pros/cons. It supports a vegan lifestyle that you have chosen for yourself as a pet parent, and so for the same reasons that you don’t want to eat animal products – you probably don’t want your pet to. If you want a truly vegan home, than your dog needs to eat vegan dog food too. Some pets have an allergy to animal protein. It may not be your first choice in diet, but to keep them comfortable and avoid digestion issues you’ll need to go vegan. The quality of meat in animal based dog food is usually not at a quality level that you would feed yourself or your kids. If your pet is really part of your family, you may simply want to feed him a high quality organic, natural diet. Dr. Harvey’s Veg-To-Bowl Grain-free Dog Food Pre-Mix is made up of 9 different vegetables and herbs that look like freeze dried astronaut food. Before feeding time, just soak the veggies in hot water to reconstitute them. Pets find it surprisingly tasty and you’ll be able to pronounce every single ingredient inside. It’s important to note that there is no protein in this food, and you’re meant to add your own source of protein to the mix. To keep vegan, Beans and Legumes are the best source of protein you can find. Popular choices include black beans, chickpeas, and lentils. The best part of this food is that it contains absolutely no chemicals, preservatives, or dyes. It is all natural with no man-made ingredients which make it great for dogs with allergies or sensitive stomachs. It also prevents the smelly breath some dogs have eating regular kibble. V-dog Kibble is a plant based, cruelty-free, completely vegan dog food. It’s one of the healthiest recipe’s you’ll find on the market. Many pet parents find that it leaves their dog’s coat shinier and gives them increased energy. It even comes in beautiful – and 100% compostable – packaging. The only downside to this product is the price. It’s on the higher end of the scale, so it’s may not be affordable for everyone. However, if your dog is unable to digest protein or has severe allergies, the price of feeding them v-dog kibble is far less than the price of vet bills or medication. V-dog exceeds AAFCO adult dog food nutritional standards and they’re known to have really super customer service as well if you have any problems or questions. Evolution Dog Food is an especially good choice if your dog has skin issues. It’s often given credit for pets’ beautiful, lustrous coats. If you are in a household with multiple pets and only one needs to be on a vegan diet for health reasons, you probably don’t want to buy 2 types of food. With Evolution, you can easily feed this food to all dogs, adding high quality animal protein to those who are allowed it. It’s a 100% complete formula for all stages of life. The downside here is that the food is not organic. The food is highly concentrated so you can feed your pet less volume and still give them the same nutrition – it’s this fact that makes the high price tag not feel so high – if you do the math. A bonus – it smells really good, kind of like tomato! Halo Vegan Garden Medley Stew is a dry food that’s good for all life stages. As with most other vegan foods, it’s known for giving dogs a boost of energy, a shiny coat, and helping keep digestive issues at bay. It’s got some really fun ingredients like sweet potatoes, cranberries, and blueberries. The first ingredient is green peas! The peas, in combination with chickpeas, give this food very adequate protein levels for your vegan pup. Unfortunately for those who like to buy in bulk, it only comes in smaller bags. Interesting side note – this is the brand that Ellen DeGeneres is a co-owner of and of course, the only food she feeds her pets. They also have a great cause marketing program that helps feed shelter dogs. The really cool thing about Wysong Vegan Dry Diet food is that it’s ‘one size fits all’. More specifically, it’s great for both dogs and cats – of all ages and all sizes. Gone are the days of having to buy different foods for each pet in the household – and running out of them at different times causing countless trips to the store. It contains important omega-3 fatty acids, probiotics, antioxidants and also has tons of other vitamins and minerals that are important for a healthy diet. If you’re a proud patriot, you’ll like this product as it’s made in the USA! The food comes in multiple sizes so you can choose which works best for your household – a 5 pound bag, a 20 pound box, or a 40 pound case. Be careful – there is a note in the website that says it’s meant to be a base for meat products, so make sure to do your research to see if it has enough protein. There are a lot of opinions in the animal welfare field that question whether a meatless diet is healthy enough for companion animals. With two passionate sides in this debate – it’s best to do your own research. Sometimes we as humans extend our lifestyle choices to our pets, even if it’s not natural for them or a choice they would have in the wild. Is the decision to move to an all vegan dog food diet a selfish one, or is it really going to benefit your pet? Important reminder – it’s always recommended that you consult with your veterinarian before making a significant change to your pet’s diet. Have you switched to vegan dog food? If so, tell us why in the comments below! Vegan food is an interesting thing to consider for dogs. 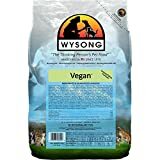 I am somewhat a vegan myself, so it’d be awesome to get my dogs to eat vegan as well. I wonder if I could eat these foods, haha! Just kidding, but seriously, I might get my dogs some vegan based dog food. That’s cool. I didn’t know vegan food was good for dogs. I’m not much of a vegan myself, but if it’s proper for dogs I may buy some of these dog food brands. I don’t know if my dog would get into it or not, but I suppose I’ll find out soon enough. Our dog has been on a homemade Vegan diet. I didn’t even know that they made commercial Vegan recipes. We will have to give some of these a try. Veganism is big for our family, and we want our pup to be on board with us. Thanks for sharing these top picks! I haven’t ever considered feeding my dog a Vegan diet, but the more I hear about it, the better it sounds. I think that we may switch to a Vegan diet, at least temporarily, to see if we notice any differences with Rosco’s digestion. V-Dog Kibble has been added to our cart, so we shall see if he likes it!